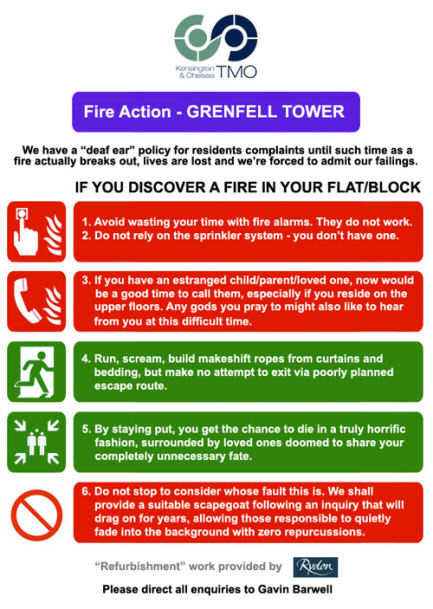 Any comment on the horrendous tragedy in London on Monday night would probably be superfluous, but the fact that the pretendy Prime Minister refused to meet with the surviving residents of Grenfell Tower (on 'security grounds', it is claimed) and then announced a public enquiry does not give any cause for hope that those responsible for enabling this catastrophe will ever be properly held to account. Because in this thoroughly corrupt State, we know all too well that 'public enquiries' are not intended to enlighten, but to obfuscate; they are not there to instruct but to distract; and they are there to give a veneer of concern to concerted acts of institutional mutual arse-covering. The report will be sat on by ministers anyway, and no action of any substance will be taken for fear of causing a 'regulatory burden' to the 'business community'.